MRM, Esther Helt and storyteller husband, Spiv Helt, with MRM's children, Julie and Jenny MacDonald. 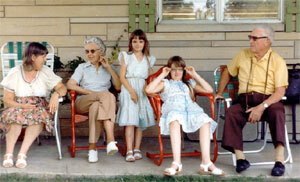 On the Helt's back porch, circa 1980. I was born and raised in Jennings County, Indiana. My mother's people settled a tiny village called Scipio. Growing up, I spent many hours along with my parents visiting the Scipio folks. I wanted to use my folklore analysis skills to document the particular brand of storying which takes place when Scipio folks get together. That book became Scipio Storytelling. To do this I taped over 200 hours of conversation in Scipio. What the folks there really wanted was a local history of their community. So, to thank them for all they did to help with my project, I wrote Scipio, Indiana: Threads from the Past, an especially well-documented local history.